At WebDev Works, LLC, our focus is on custom built solutions tailored to your Internet needs. We have more than 20 years experience in all phases of Internet design and development. And we have worked with organizations of all sizes. 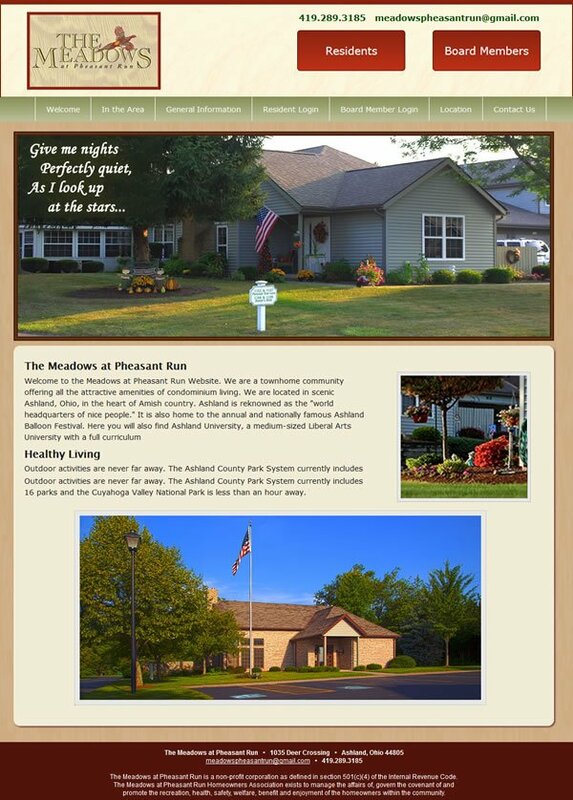 In addition to much work for DBA's and LLC's our clients have included non-profit organizations like Hospice of North Central Ohio and Ashland County Community Foundation. We have built Webstores for Maurice Lenell/Hearthside cookies and full-scope online quoting, inventory management, and ordering systems for Gregory Industries. 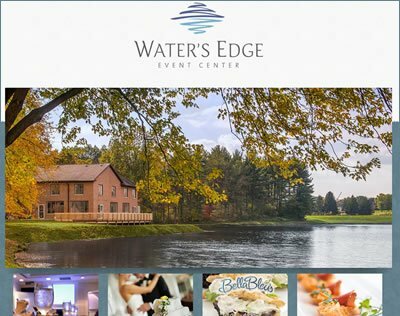 And we have built online training and orientation programs in conjunction with the Ohio State University for clients like Time-Warner Cable, Mettler-Toledo, and Bookmasters, Inc. We have several partnerships with area companies that allow us to bring you a comprehensive set of skills and years of experience. Contact us today! A database is a collection of information organized so that it can be easily input, accessed, managed, and updated. Databases can be classified according to types of content: bibliographic, full-text, numeric, and graphic. This information can be retrieved and presented in reports, charts, graphs and forms, customized into most any kind of presentational format. Inventory tracking systems, list management, document libraries, and sales records, for example. It can be a marketing vehicle or management tool. We can create a database that fulfills your precise requirements and will allow you to manage business data, delivered in custom designed software. Studies from 2018 by the Pew Research Center reported that more than 95% of American adults own a smartphone, more than 20% of people worldwide own a tablet device of some kind and 72% of cell and tablet users go onto the Internet "mostly using their phones" rather than a desktop or laptop computer. What does this mean? Your Website must be mobile-compatible and should be able to pass the Google Mobile-Compatible test. You can have either distinct desktop and mobile sites, or a single responsive site that displays elegantly on any size device. If your site is not yet mobile compatible - unless it is behind a firewall or will be used by people who use only larger screen devices - you should be mobile compatible. Also, new directives from both Google and PayPal indicate that your site should be secured as Google envisions an Internet in the not distant future wherein all Websites will be secured; i.e., use the HTTPS protocol rather than the venerable HTTP. We can build you a site rich with dynamic possibility, sites that delight your customers while maintaining your brand integrity. We can create the cyber-equivalent of anything. The following Websites have all been graphically designed and technically developed by WebDev Works, LLC. Note that these portfolio items are only a small sample of our Website creations. Much of our work is not accessible to the public because it is either on secured login sites or behind corporate firewalls. You can contact us by email or contact us by phone at 419-282-0186 contact us by phone if you would like to see more of our work, to request testimonials and references or to see demonstrations of our interactive, data-driven sites. Go to our Clients section to see secured and/or firewall projects and our clients for those projects. Click the graphics to see more details. Much of the work for the clients listed below is not accessible to the public because it is either on secured sites or behind corporate firewalls. Other sites have partially public sites with the majority of the functionality being proprietary. Providing links to most of these sites would take our visitors only to a login page. If you would like to see demos of any of the following, please contact us by email or give us a phone call at 419.282.0186 and we can arrange demonstrations of these systems. You can also use our contact form if you prefer. Click or tap a graphic to see more information on the client and project. For more than 40 years, Rego Diamond Designs has been a highly respected diamond manufacturing and design company with thousands of dealers throughout the United States. Rego contracted WebDev Works to develop a Memorandum and Merchandise Tracking database system to provide their customers with a Web portal through which to log in and retrieve memorandum and merchandise records along with information on consignment goods shipped by Rego to that customer. The tabbed administrator interface included multiple views of customer records, including multiple editable fields for customer records. When Time-Warner cable acquired Adelphia Communications, they needed to quickly incorporate the 14,000 Adelphia employee records into their system as well as provide training and orientation for all the employees making the transition. 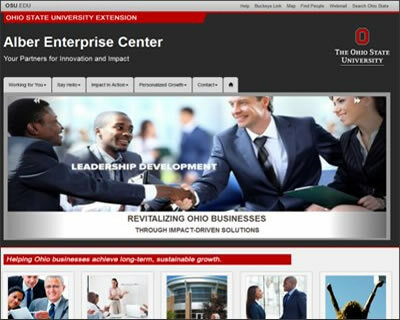 WebDev Works, partnering with The Ohio State University Center Alber Enterprise Center, designed, developed and implemented a full-featured online Orientation and Training system for Time-Warner. This was integrated with the Time-Warner LDAP Employee Database, and included a system of extensive multimedia modules and Learning Management Systems. The system also provided an administrator interface with an extensive suite of tools to manage employee, orientation and training records. Salesman Calendars: sales, sales calls, and itineraries sortable by salesman, day, week, month and year. Territory Calendars with the same views as Salesman Calendar. Sales Breakdown charts and graphs, sortable by day, month and year. Charts and Graphs for Booking, Sales, Orders, Accounts Receivable, Inventory, Plus/Minus financials. Customizable printable reports for all above. WebDev Works initially built this branded merchandise Webstore in 2004 and we have periodically redesigned it and upgraded backend technology. It is now a responsive Website Webstore with many customized reports for administrators and financial personnel, including a real time wholesale cost and profit tracking application along with long-term sales metrics reports. 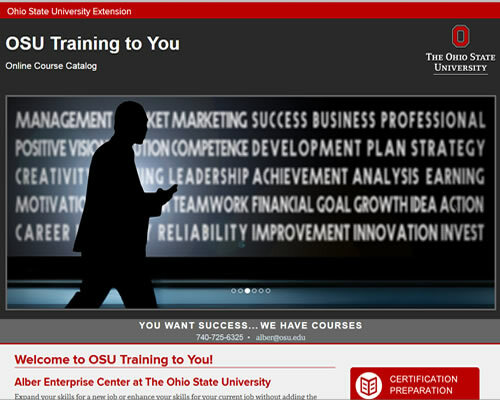 OSU Training to You online course catalog portal, registration and online course access. Alber Enterprise Center: Currently managing 2 Departmental Websites. Industrial Welding and Systems Engineering Department: Departmental Website. Integrated Systems Engineering: Departmental Website. The Ohio State University at Marion: Event Registration Website. 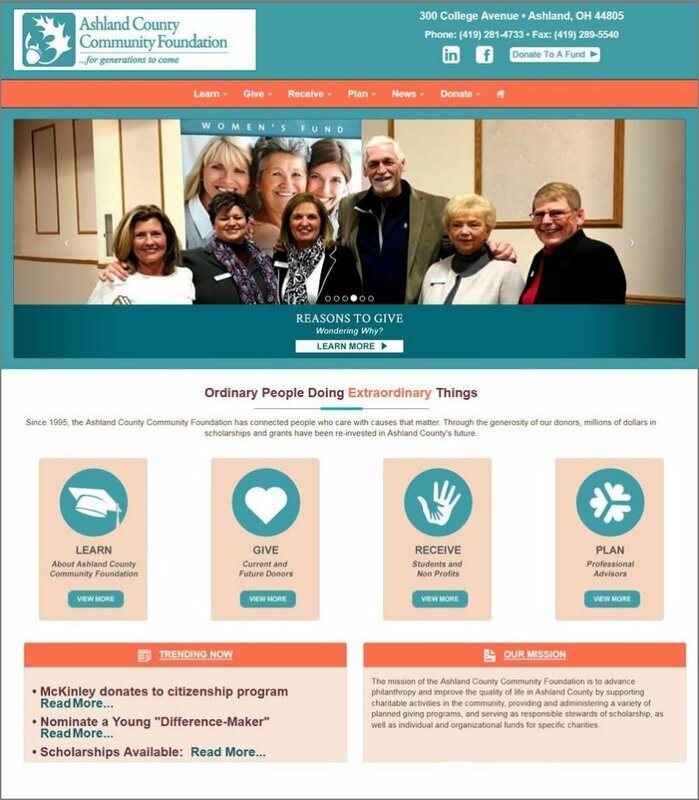 Center for Corporate and Community Education: Organizational Website. Guenther Mechanical is a multi-generational, family owned mechanical engineering company. We built a Website allowing employees to utilize a vacation and exception time tacker tool, interactive phone lists, and job detail listings with integrated directions generator. The most comprehensive feature is an extensive plan room area giving employees and contractors the capability to view and download current job and bid documentation, and to select, save and download documenation packets. A suite of administrator tools include integrated proprietary file transfer system to manage job and bid details and documentation. It also provides capability to manage employee records, vacation and exception time, and to compile and run customized daily, weekly, and annual reports. Also available is functionality to manage phone lists, vendor accounts, and setting access permissions by documenation- or job-specific parameters. For this organization in Columbia South Carolina we set up a customized online job application complete with a full suite of administrator tools, including job posting and review area. This client was one of several who contracted us to customize our copyrighted Online Orientation and Training software package for them. We added video production to the Mettler Toledo version. Bookmasters also contracted us to customize our copyrighted Online Orientation and Training software package for them. We added video production to the Bookmasters version as well as an enhanced LDAP protocol to interface with their employee records. 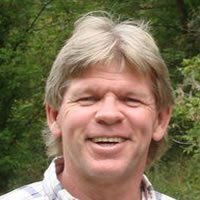 Allan Andersen, Lead Web Application & Database System Developer at WebDev Works, LLC, was an English Literature Instructor at the University of Colorado in Boulder before he cut his teeth in the Internet Industry in the mid 1990's working at Mesa Development in Boulder, Colorado. Here he developed Windows Help systems for products such as Norton's ACT! Contact Management System®, Logitec FotoMan® and Logitec MovieMan®. Windows Help utilized early versions of what has come to be known as hypertext and hypergraphics, the bedrock of Internet Website technology. The Rocky Mountain Society of Technical Communications awarded a Best In Show award to Mesa for Logitec FotoMan® Help. 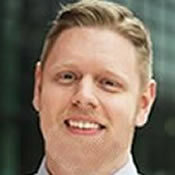 Allan later worked at US WEST and Qwest Communications as a Software Application Developer and in 2001 founded WebDev Works, LLC in Ashland, Ohio. Since then, he has built hundreds of Websites and architected hundreds of database systems. He has also worked as a professional photographer and held many gallery exhibits. 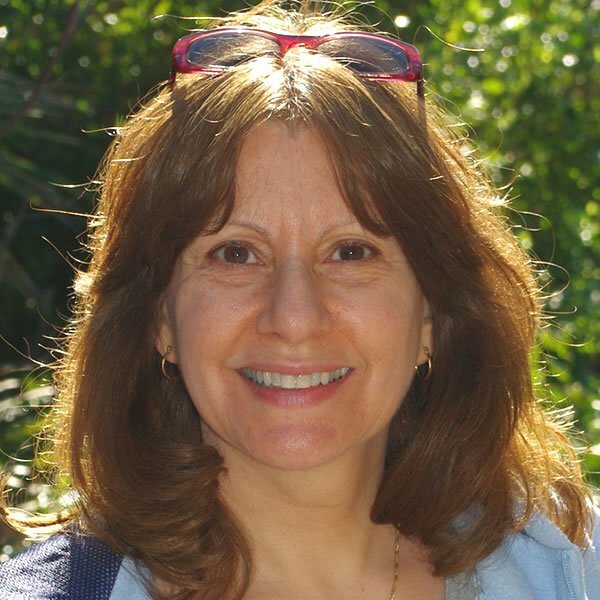 Mary-Rose Andersen has worked in both the Education and Health Care industries. Her love, however, has always been graphic design, working with colors, configuration and layout which makes her a great asset for site design and layout. She also has strong organizational skills which makes her invaluable around the office. Andy Raylor says he "learned to communicate with electronic devices before he could talk to humans." His love of computers and programming began there and has grown since. But he has learned to enjoy fellow humans as much as computers! He enjoys the challenge of software programming. Pricing depends on many factors: the size of the site, the degree of interactive functionality, and many other factors. WebDev Works can develop a Website for any size company with most any size budget. We have built streamlined and compact Websites for under $1000 and robust multi-featured, data driven sites for large clients that have cost upwards of $20,000. Contact us to discuss your needs. Let us show you how we can build a Website to fit your needs. We pride ourselves on our flexibility and ability to customize a site to do what you need it to do within the budget you have established. Contact us today by email or give us a phone call at 419.282.0186 to get an idea as to cost and what is possible. If you prefer, use our contact form. WebDev Works is proud to have been associated with The Ohio State University since 2002. 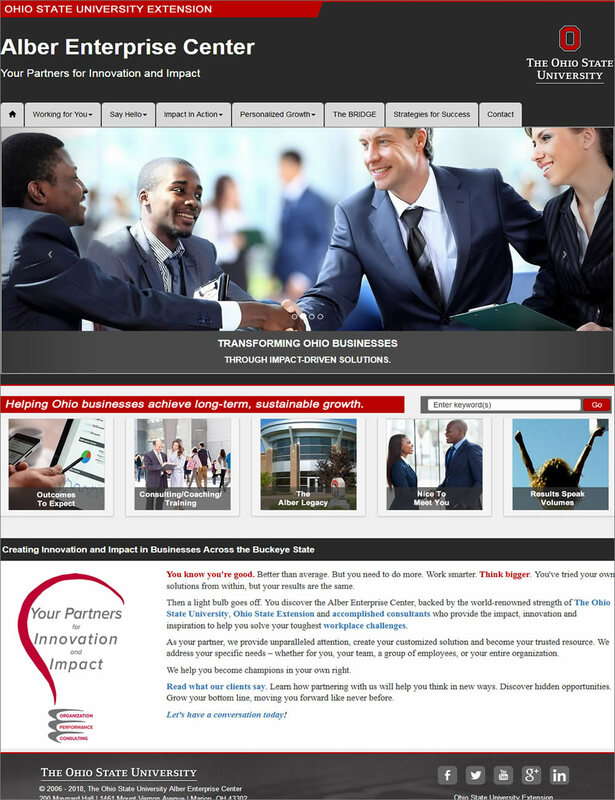 This site is one of several projects WebDev Works has completed for various departments and organizations at The Ohio State University. 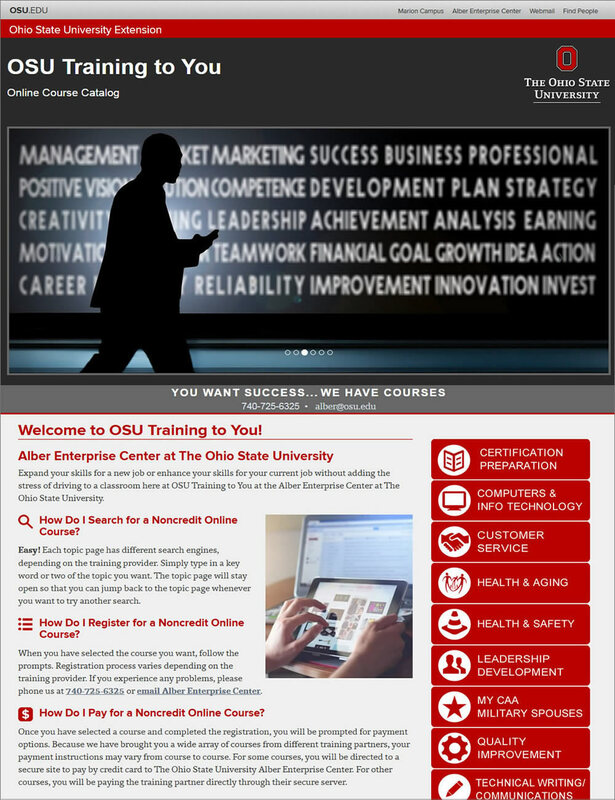 The OSU Training to You site, a division of the Alber Enterprise Center, features an online class registration interface linked to in-house and third party Learning Management Systems. It also features a suite of administrator tools for managing students, course listing, and registration records. Launch Website in a New Tab / Window. WebDev Works is proud to have been associated with The Ohio State University since 2002. This site is a sister-site to OSU Training to You and offers much information on the services offered by the Alber Center. Alber provides manufacturing organizations with coaching mentoring, leadership development training, business solutions, and many more strategic programs to boost success. 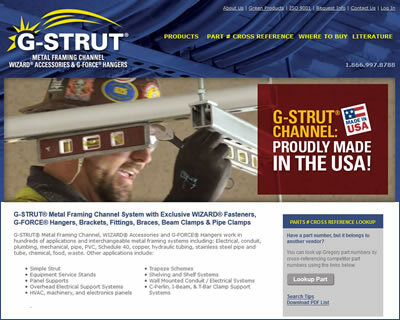 Gregory Industries is a leading provider of G-Strut metal framing channel, Wizard® Accessories, and G-Force® Hangers. These components can be used in hundreds of applications and interchangeable metal framing systems. We built an extensive and comprehensive product management and inventory system for over 7,000 parts along with an 18 vendor cross-reference system for looking up parts. The backend database system is the foundation for this site. The graphic design of this site was the challenge... and the fun. 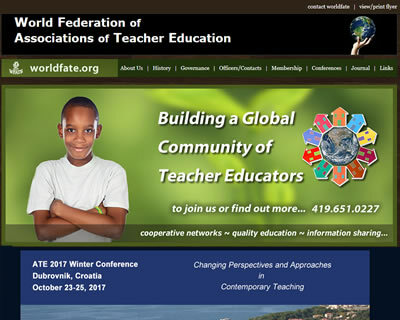 We wanted to convey youth against a backdrop of the global village holding up the world as the backdrop for the WFATE organization. We think/hope we captured that! Interactive features include online conference and membership sign-up and payment interfaces. 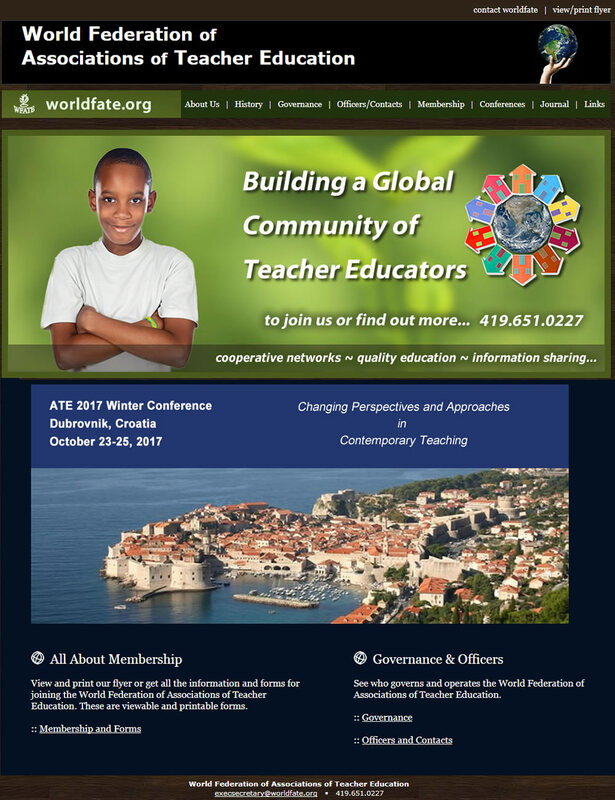 WebDev Works is honored to have been associated with ACCF since 2003. 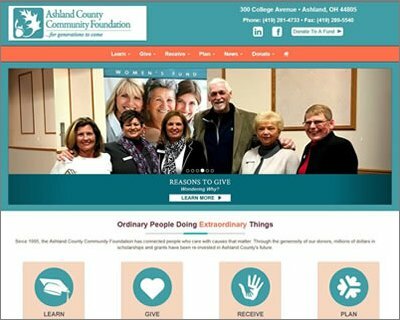 After the initial site design and deployment that year, we have refreshed their site on several occasions, each time to keep ACCF's Website integrated with the latest Internet technologies and design features. The donation portion of their site features a fully interactive and customized donation interface with robust donor account and donation catalog management interface. 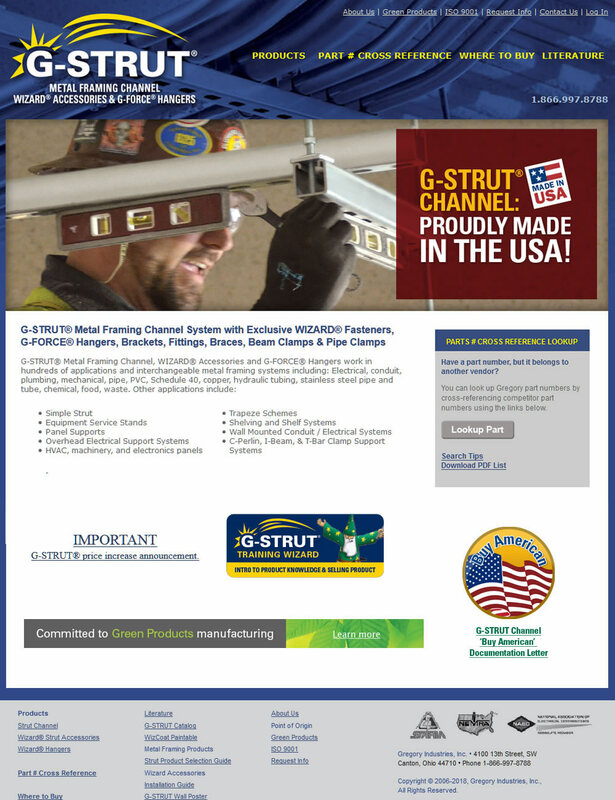 The main site features two flexible content management systems, and a handheld device-friendly responsive Web design. 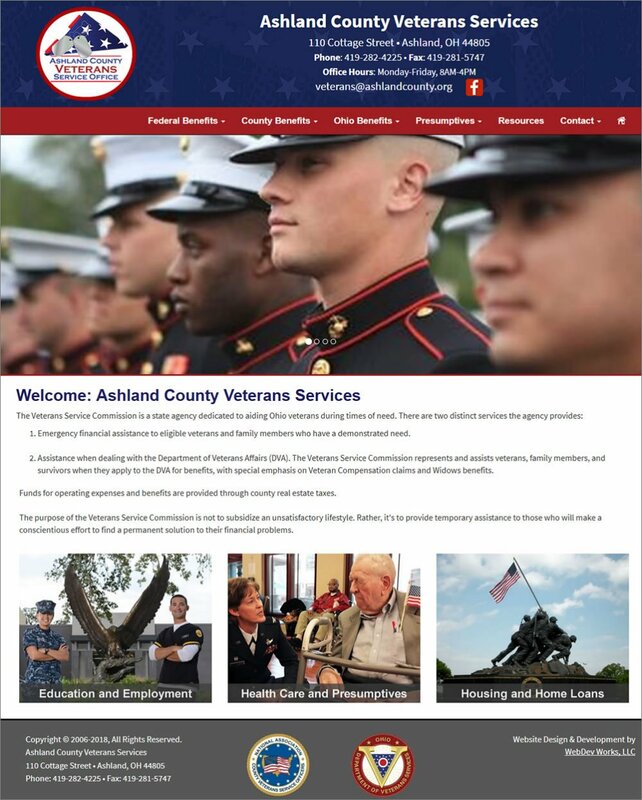 The Ashland County Veterans Services is a state agency dedicated to aiding Ohio veterans during times of need. 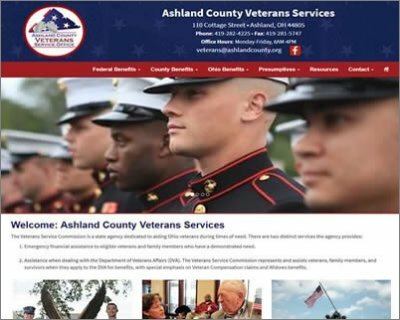 WebDev Works provided them with a mobile compatible Responsive Web Design site, Content Management System and much needed publicity for this under-appreciated organization. Launch Website in a New Tab or Window. 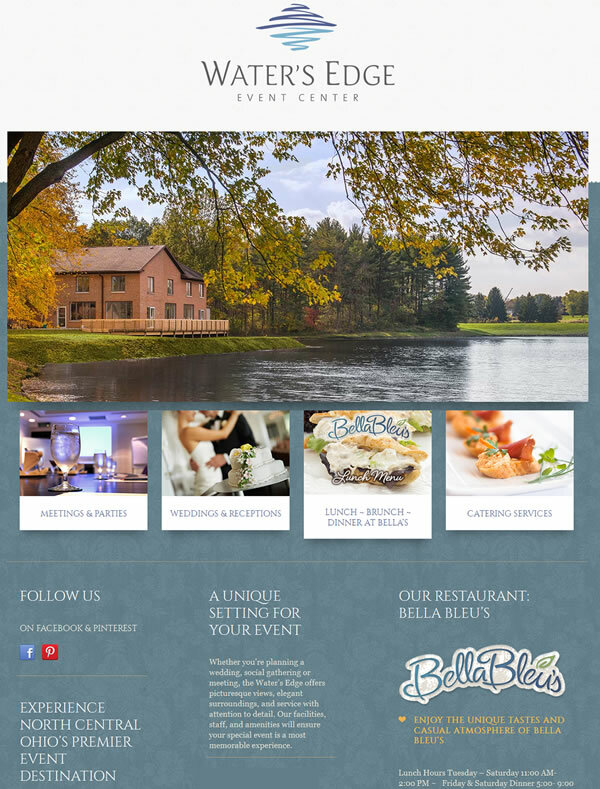 Bella Bleus restaurant, an elegant place with an elegant Website. 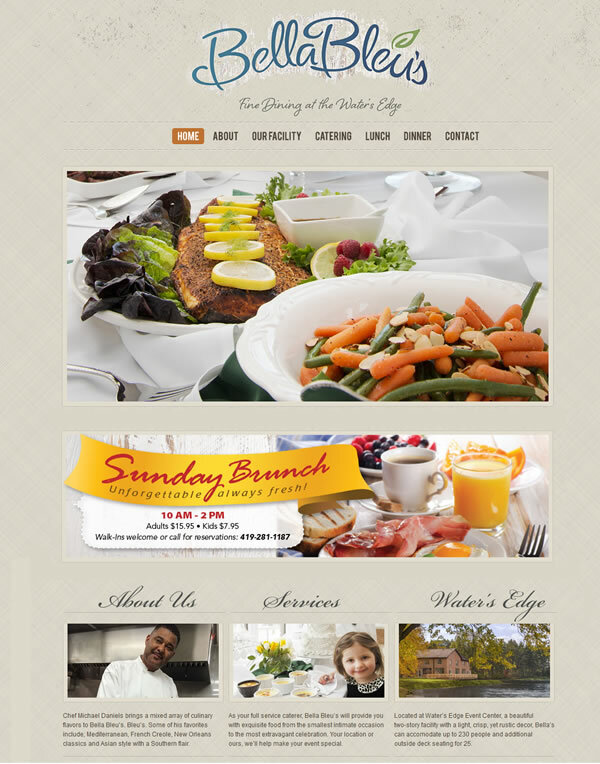 This was built using WordPress and some customizations. 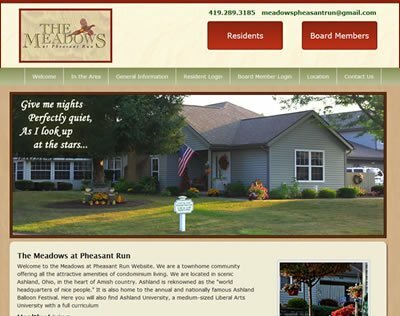 The Meadows at Pheasant Run, features two separate secured areas for both residents and the Board of Trustees. 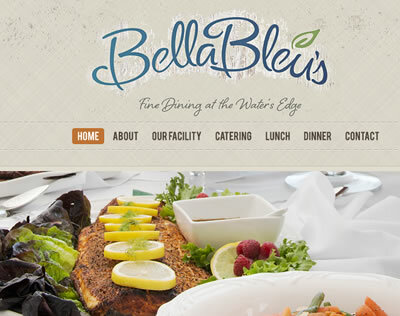 Waters Edge, sister-site to Bella Bleus, another WordPress site. 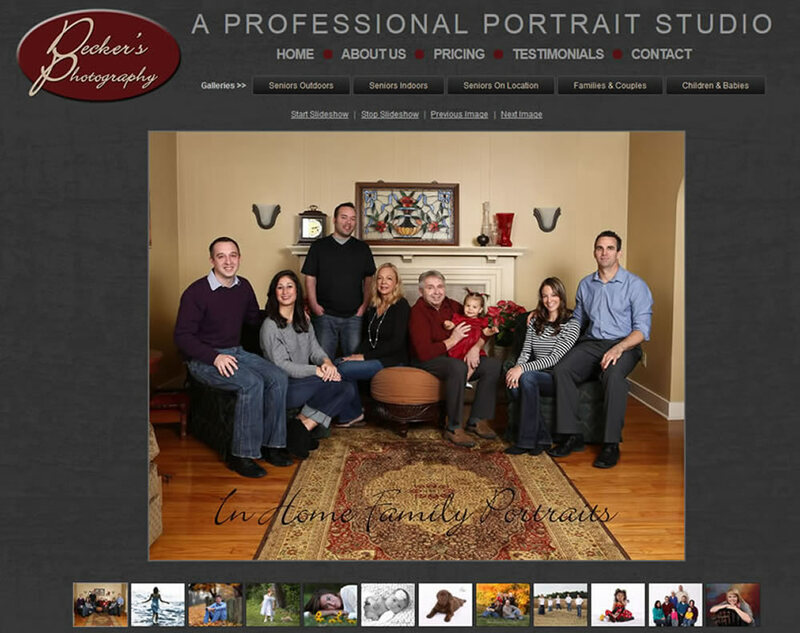 For this site that features Dave Decker's superlative portrait photography, we provided a variety of presentation formats - primarily thumbnail slideshow protocols - and a layout that allowed Decker's Photography to "pop." 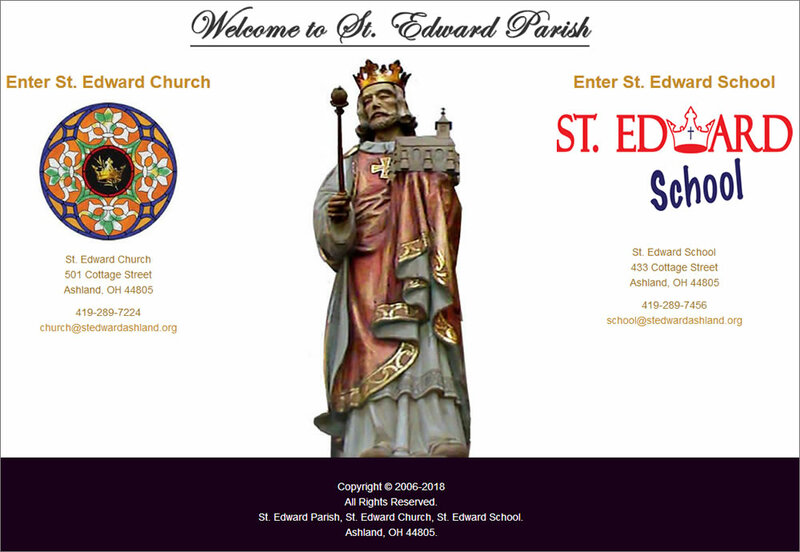 St. Edward Parish is a dual Website. The church site is driven by a CMS and features a virtual tour and other interactive features. 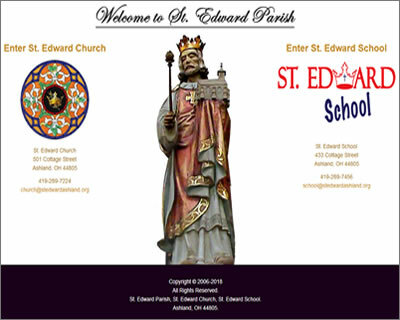 The St. Edward School is a National Blue Ribbon School award winner, a prestigious award given by the U.S. Department of Education. WebDev Works original redesign of the site included a refreshed graphic design and layout, multi-media features, administrative tools, a content management system, a robust event calendar application, and a cyber-state-of-the-art virtual tour. 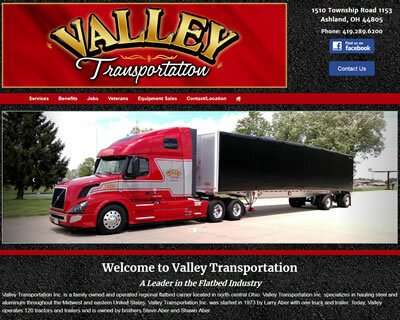 Valley Transportation, a steel carrier truck service, leads the industry in customer service, safety, quality vehicles and equipment. 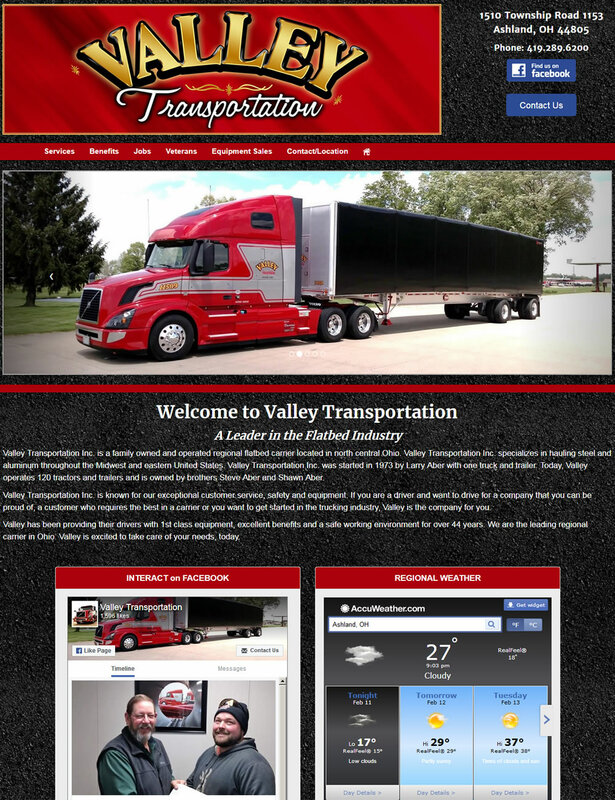 Valley Transportation wanted a BIG BOLD site and that is what we gave them. Interactive features include an online job application and administrator management tools for the job applications. We also built a Content Management System for the site.